LG is surely making headway in making pocket-friendly phones. 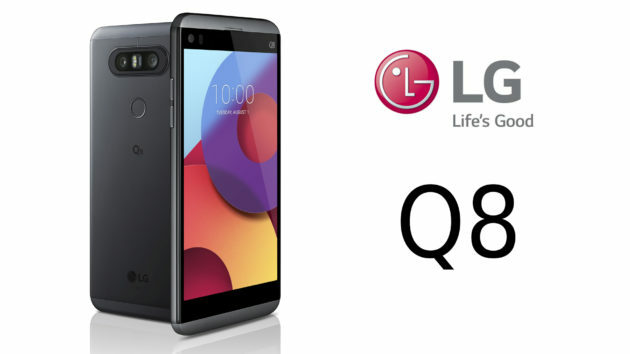 The brand recently released a new device for their Q smartphone series in their Italian promo site, the LG Q8. The phone is a smaller, pocketable version of the LG V20, which was released last year. Just with an added water-resistant feature and a non-removable battery. The Q8 is powered by a Qualcomm Snapdragon 820 processor, is running on Android Nougat 7.0, and has a 4GB RAM, same as the V20. Though the V20 has a 64GB internal memory, the Q8 only has 32GB which is still expandable via a MicroSD. Both devices feature a dual-camera system on the rear, though the Q8’s rear is sporting a 13MP + 8MP with wide angle lens along with a 5MP front cam. Both also have 1440p display on the front, and a special screen at the top for shortcuts and extra on-screen buttons. Aside from this, the device also features a secondary display to the side of the selfie camera. The device also has the V20’s 32-bit Hi-Fi Quad DAC (digital to analog converter) for a superior audio quality. The LG Q8 has a metal body with IP67 waterproof and dust-proof technology, which allows it to be submerged in as deep as 1 meter of water for as long as 30 minutes. The Q8 has a shorter and narrower frame and a 5.2-inch display, compared to the V20 with its 5.7-inch display. Its screen is also protected by Corning Gorilla Glass 4. Though the LG Q8 doesn’t have a removable battery, it still boasts a 3,000 mAh battery which can provide enough power to get you through the whole day. The device was launched in Italy last July 20, though a UK release isn’t too far behind. LG is expected to unveil the Q8 officially on August 31, most probably alongside the new LG30. As of now, there are no news as to if the device will debut in the Philippines. The prices have not yet been announced as of this moment. Though we can be sure that it will be cheaper than its bigger counterpart, which debuted at an estimated price of 39,200 Php.